If arriving via MetroLink use either the 'Lambert-East stop' for Southwest, Frontier & Charters - or the 'Lambert-Main stop' for all other airlines - both stops are close to their terminals. It is strongly advisable to arrive at the Airport 2 hours prior to scheduled flight, but to add more time for holiday travel times. Getting around STL: Free shuttle buses continuously run between the terminals, and both terminals have a MetroLink Red Line station to downtown St. Louis. Passengers arriving from Air Choice One or Cape Air flights, will be shuttled to their departing Concourse - no need to go through security screening. Use either the courtesy phone or dial Air choice One(314-843-8586) or Cape Air (314-222-5322). - TSA pre-check: Eligible passengers of American, Delta, United & US Airways can now go through its expedited lane. For more information visit: tsa.gov. - International Arrivals: Terminal 2 has on its lower level Immigration & Customs gates. Unless you have gone through US customs clearance at participating airports, you need to go through passport check, retrieve checked bags, go through customs clearance and - if transferring to another flight - re-check-in bags. - Security checkpoints: T1, A gates, 4am-8:30pm; T1 C gates: 3:45am-9:30pm; T2, E gates: 3:30am-10pm. - ID Requirements: While US Passport, DHS trusted traveler card or US Military ID is currently acceptable, starting Jan. 22, 2018 driver licenses from non-compliant state Missoury are not accepted. - WiFi Boingo access is free to passengers for one daily login of up to 20 minutes; hereafter $7.95 per day will apply. Toll-free WiFi support: 800-880-4117. - ADA Access: The terminals are fully accessible; for more information call 314-890-1333. Persons with disabilities may use the special TSA lane (visit www.TSA.gov, or email [email protected], or call 866-289-9673). Service animal relief areas are at T1, near exit 6, near gates A16, C24, and at T2 ner exit 15 and near gates E4, E40. ADA Parking is available at both terminals near an elevator. - Airlines: see detailed listing in the introductory page of this site. Terminal 1 of Lambert Airport with Concourses A and C. The Terminal has a lower, mid, & upper level. Note that the Hudson Group, under a 10-year contract, has added /is adding: news, gift & specialty retail concessions at 13 locations offering top national brands. It also reopens a majority of existing stores operated currently by Paradies shops. A new lounge with art, live green wall, water feature & view of arched windows was just completed offering rotating exhibits, red leather seating, and a welcome respite & beauty. The Lower Level of T1 (with outside Arrivals Drive) houses the baggage claim, banking facilities, and has in the center four information points, doors 11 - 18 (doors 16,15 & 14 lead to the yellow level of the parking garage). American Airline Service is at Door 17 (with Federal Credit Union). 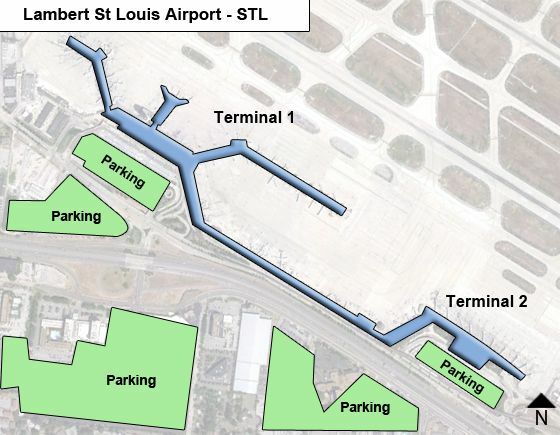 Outside of the lower level are the shuttle & bus port, off-airport shuttle, & taxi stands. The USO lounge is to the left of the baggage carousels, next to the Post Office. The Mid-Level of T1 houses a few food & drink establishments, services & amenities, including ATMs, Airport administrative offices, & USO lounge (at Concourse A security checkpoint /Exit 17). The Upper Level of T1 (with outside Departures Drive) has a few food & drink establishments, information points and doors 1 - 6. Concourse A of T1 with gates A2-A21 serves Air Canada, Delta, United & EXTRAirways (its domestic arrivals only). It houses a number of food & drink facilities near the gates. Concourse C of T1 with gates C1-C24 serves Air Choice One, Alaska, American, Cape Air & Frontier (all of its departures & domestic arrivals). Concourse C has a Travelmart, vending machines, and a few other stores. Terminal 2 of Lambert Airport with Concourse E. T2 is currently mainly served by Southwest Airlines, which recently added gates E31 & E33. It also installed two new jetways, new carpeting, new podiums and new coutners . The western gates E29-33 also received some upgrades and added new retail & food kiosks. The Lower Level of T2 is the Arrivals level with Immigration & Customs facilities & baggage claim. Outside of it are ground transportation options. The Upper Level of T2 is the Departures level with ticketing desks, food & drink, shops & services and access to the E gateway with gates E2-33. T2 connects to the Hourly Parking facility. Concourse E of T2 (Gates E2-E14 are to the right, & gates E16-E24 to the left, with separate gates E29-E33 south of E24. E gates are served by Frontier (international arrivals), EXTRAirways (international arrivals), and Southwest (using gates E4-E24 and E31 & E33).